I've had this sweater since high school. I think it's the first or one of the first sweaters I bought with my own money. It's a tatty oversized cardigan from the Limited Express. I noticed recently that the tiny hole on the elbow has grown a little. 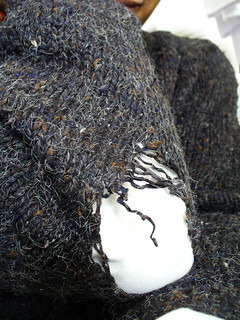 Now than I know how to knit, I suppose I could fix it but the sweater in in such pathetic shape overall, everyone else is voting that I just dump it. In fact they've tried to get me to trash it for about 13 years now. You know how there's always that article of clothing on What Not To Wear that the makeover victim fishes out of the trash despite the fact that whatever it is is ill-fitting, ugly and should be burned? This is the one I'd be fishing out of the trash. But... I may have to admit it's not worth darning.